Continuing with the tour of John Lautner-designed homes (all these homes were shown last weekend as part of the MAK Center and Hammer Museum's current Lautner retrospective), behold his "homage to the curve" (so said the NYT in 1990), Silvertop. The 7,500 square foot house was designed to follow the contour of the hilltop, so that its original owner, could have a view from the ocean to the hills. 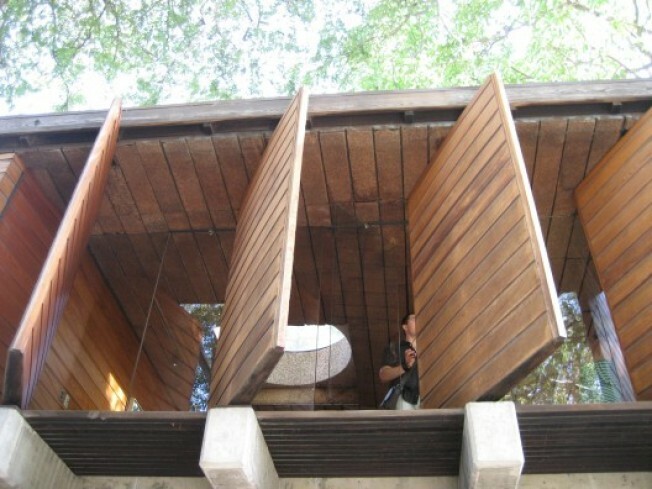 The house, one of Lautner's favorites, was built from 1957 to 1963 but wasn't occupied until 1976 by the second owners, Philip and Jacklyn Burchill, because the original client, Kenneth Reiner, had run into financial difficulties. The four-bedroom house features a curving living room window wall made from five hanging glass panels, exterior panels or louvers take the place of curtains or drapes, and the swimming pool flows over the edge, seemingly into the reservoir. Yes, we'll take it.